Remember this? 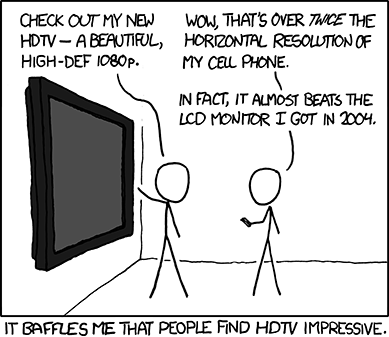 This xkcd is from ~2010 (870 comics ago/52*3 comics/week=5.6 years), and was true since the 1980s [with VGA monitors, the Apple ][ era used TVs]. Sometime since then 4x HDTVs (3840 x 2160) have become relatively inexpensive. The catch? (and why you don't have one in front of your keyboard)? They operate at 30Hz (the cheap ones. The ones that do 60Hz all seem to match the Mac monitor prices that could do this in 2010). [My only hope is that the alt text isn't sufficiently true to keep 30Hz from being seen as a "feature"]. From what it looks like, the issues are largely getting the HDMI input and whatever DSP work needed to massage the pixels at 4x (let alone decode a 4x signal). Any guesses as to when the 60Hz monitors will match the 30Hz temptresses? For bonus points, describe an "affordable" GPU that can do 4X anywhere close to 60Hz. Course the pixel density on that one is pretty crazy. You have to be within a foot or two at most to get any benefit from that resolution. Acer's 28" is all of $70 more and probably makes much more sense. 32" will be twice the price but they're also much more readable (you can even turn off dpi scaling if you sit close). You can even get some 40" versions for ~$600 that are basically HDTV's but work for a monitor if you don't care about lag or color accuracy AT ALL. I call those monitor prices reasonable because compared to the computer needed to do much of anything graphically at that resolution they're not the big expense. Gaming I would recommend lowering the resolution to 1080P which requires zero interpolation with a 4K display so it looks pretty smooth. 5K displays are going to become increasingly common in 2016 and I think the majority of laptop/tablet/monitor resolutions will exceed 1080P in another year or so. Ultimately we don't run into limits on resolution our eye can't see until surpassing 8K assuming we're close enough to the screen and it's big enough to fill our vision. 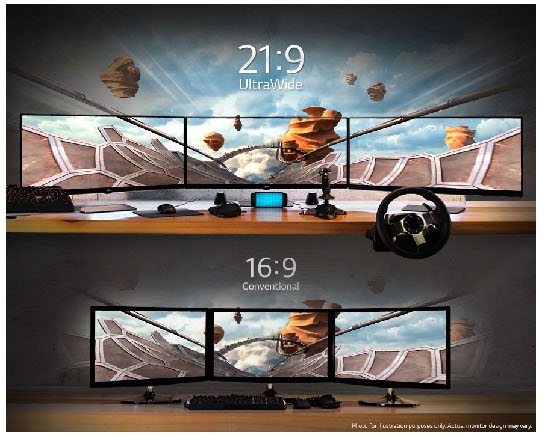 Might even see a resurgence of desktops at some point when the field of view starts limiting tablet/mobile productivity compared to a 46" 8K monitor you can sit within 2 feet of. I don't even want to imagine what it would cost to get such a thing here and now... The shipping alone would be more than I paid for my monitors. D'you reckon we'll ever see a renaissance of sensible aspect ratios? For the past decade or so, everything on offer has shifted toward 16:9, with relatively few choices outside of that (there're a few 16:10 options, notably why I got an Ultrasharp), unless you dive into niche markets like CCTV equipment, and throw your wallet overboard in the process. Lord, I wish. My workplace just replaced all our nice 5:4 monitors with 16:10 ones, and now I have to sit farther back just to be able to keep both monitors completely in my field of view. (And add to that the problem of Windows still not being made for scaling to arbitrary DPI, so everything is smaller to boot.) It's ridiculous. Just be glad it's not a pair of these bad boys. eviloatmeal wrote: Just be glad it's not a pair of these bad boys. Gives you 5:4 screen space, just like in the goold old days of ten years ago, and doesn't require any fancy stands or brackets, just what's included in the box. My setup now is a 16:9 yoko horizontal (for games, movies, etc.) with a 16:10 tate vertical for photos, browsing, reading, and shmups. No idea. I found it from LG's marketing material. commodorejohn wrote: Lord, I wish. My workplace just replaced all our nice 5:4 monitors with 16:10 ones, and now I have to sit farther back just to be able to keep both monitors completely in my field of view. (And add to that the problem of Windows still not being made for scaling to arbitrary DPI, so everything is smaller to boot.) It's ridiculous. While I agree with that scaling should be easier I rather like high DPI settings. My eyes are very good and that way more stuff fits on my screen. There are pixels sticking out of your screen. You should have someone look at that. I heard they are as dangerous as asbestos. Neil_Boekend wrote: There are pixels sticking out of your screen. You should have someone look at that. I heard they are as dangerous as asbestos. Obviously each monitor comes with a projector on the back, to create that full-detail ambient light around the screen. Ambient lights work like this. I just got a recent high-end phone. 2560 x 1440 on a 5-inch screen. Erm... yeah. Because that's totally necessary. This phone has a better resolution than the vast majority of monitors I work with. Sony released a 4K screen a while back. 5.5" of 3840x2160 resolution for a pixel pitch over 800. Already a few months old. No, there isn't a human alive who's eyeballs from any distance require that level of resolution but it does display 4K naively without artifacts. Yeah, but it displays anything under 4K with artifacts, so you better have the GPU to back it up. commodorejohn wrote: Yeah, but it displays anything under 4K with artifacts, so you better have the GPU to back it up. There's no artifacts displaying 1080 or 720 on a 4K screen. Zero. Perfect aspect ratio pixels. is 4K high enough resolution that antialiasing doesn't make any noticeable difference? if not, then it's not high enough. hotaru wrote: is 4K high enough resolution that antialiasing doesn't make any noticeable difference? if not, then it's not high enough. Only if your GPU doesn't handle anti-aliasing. Now "high enough that subpixel chroma supersampling" has no effect (since GPU makers *still* haven't figured out that we no longer use CRTs, although free/gsync is a start) would make sense. You require infinite resolution to get rid of Moire Patterns without an anti-aliasing filter. So what you ask for is impossible. Of course we should always use multisampling on minified textures (and use downscaled versions of those textures to reduce the required number of samples) to combat Moiré patterns. Hopefully, what is meant is the full-screen and/or depth supersampling type of anti-aliasing (FSAA and MSAA and the likes). That was very important back when displays had 600 lines and you could see "jaggies" everywhere if you didn't have proper AA in a 3D game. But if pixels are less than an arcminute across, FSAA won't do that much. Only if the controller is smart enough to use plain nearest-neighbor upscaling on resolutions that evenly divide the native resolution, rather than just running everything through the same crappy bilinear filtering like a lot of them do.